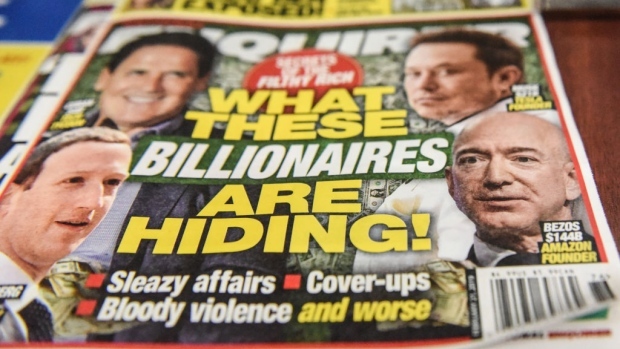 (Bloomberg) -- New Jersey officials have some questions for the local hedge fund that owns the National Enquirer’s publisher, which is embroiled in a blackmail scandal involving Amazon.com Inc.’s Jeff Bezos. The state is seeking assurances that the fund, Chatham Asset Management, is investing in businesses that “follow all applicable laws.” The state’s Division of Investment has invested in two funds that are run by the firm, the majority owner of Enquirer publisher American Media Inc. The state reached out to Chatham after a bombshell blog post published by Bezos, who accused AMI of trying to blackmail him with photos of him with a woman who wasn’t his wife. The tech billionaire also suggested that the company might have been acting on behalf of President Donald Trump and questioned whether it was motivated by coverage of Saudi Arabia in Bezos’ Washington Post newspaper. “After being made aware of media reports alleging questionable business practices by AMI, DOI contacted Chatham, reminding them of their responsibilities as fiduciary for the funds’ limited partners,” Jennifer Sciortino, a spokeswoman for New Jersey’s Office of the Treasurer, said in an email.